This short book caught me by surprise. P.J. Ingram-McPhee weaves together episodes from a seemingly ordinary life where only the person living it knows there is so much more going on. Stories from her childhood, from life with longtime friends, and her relationship with her husband are at once hilarious and meaningful. You won’t believe that so much can happen to one woman as she regales with tales of accident-proneness and secrets. When you are done laughing, the author gets right to the point of “I Almost Gave Up.” She reminds us that God is all-powerful and has a purpose for everything in your life — even the crazy, funny bits. 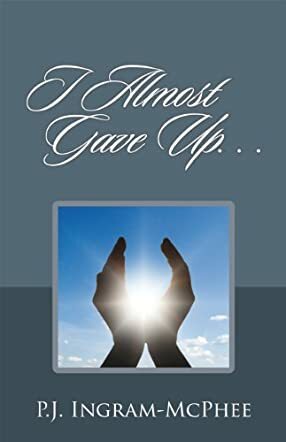 I loved “I Almost Gave Up.” P.J. Ingram-McPhee’s writing style reminds me of that of my favorite famous Southern writer, Flannery O’Connor. The stories kept me turning pages right to the end to find out how she would tie it all together; I was not disappointed. I was touched by her passion for the people of God and her vow to “always have encouraging words for everyone I meet.” When you think of all she has been through, surgical pins, steel plates, and all, you realize that she is a walking miracle and has the attitude to prove it. If you are weighed down and discouraged by life, I promise this book will both lift you up and also put your eyes on the One who can make the difference for you. Somehow God has put all P.J.’s trials into a crazy quilt of testimony to His goodness and mercy and He can do the same for you.